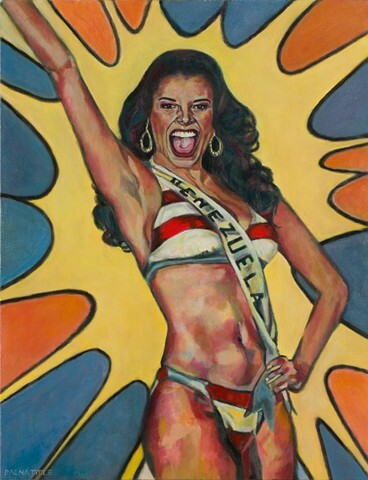 With her dramatic gesture and wide smile, Miss Venezuela seems enthusiastically committed to her bathing suit competition. But there is something a little dead behind her eyes. So, what's she really feeling... how much of this is real; how much of it is her "playing the game"? The Pop-like comic book "Pow" background asks: Is she a true heroine to be admired? Or is she another commodity selling herself? The flattened space and two dimensionality of my brushstrokes formally call out the falseness of what we see. The marks on the canvas are not actual flesh, they just pretend to be. And Miss Venezuela... she seems to be pretending, too.